The best skin tone smoother – Vitamin C tonic! 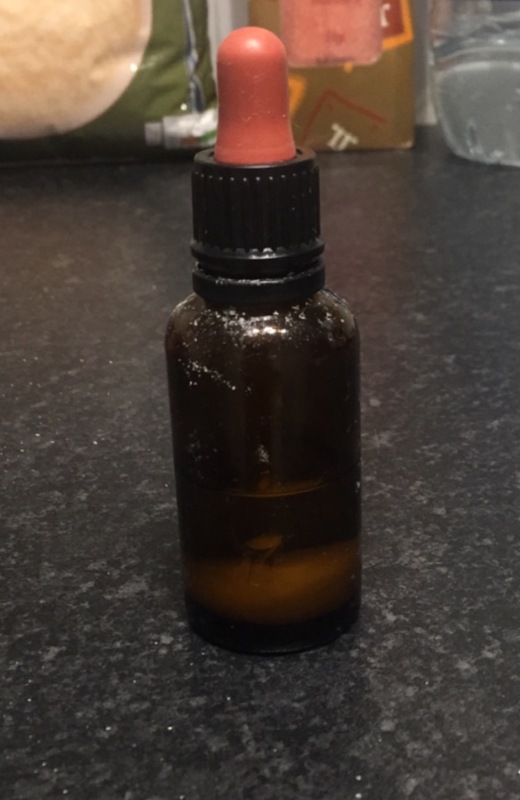 I recently showed my Snapchat followers (snap: eleiseonline) my favourite skincare secret, and I was inundated with requests for the recipe, so I thought I’d share the full recipe on my blog! Whenever I say to people about this they always go …’don’t you mean vitamin E? ?’….Nope…I mean Vitamin C. Vitamin C can be used topically to help treat scarring and skin tone, but is not commonly used in shop bought cosmetics as its unstable, so they opt for Vitamin E or A instead. When I say unstable, Basically vitamin C deteriorates with light, heat, and air so it can’t be used to its full potential in products that have to have a shelf life. Vitamin C is a wonder product for improving skin tone and texture and also is also one of the most effective ingredients to combat and prevent signs of aging thanks to its ability to stimulate collagen production in a serious way. There are several things to keep in mind when making this yourself as vitamin C is after all an acid. Always use distilled water as the PH in tap water can differ the effect of absorption into the skin, tap water also has many nasty’s in it. Buy the most finely ground/easily dissolved powder you can, its much easier to make. Theres much debate about weather Vitamin C ( absorb acid) and (L- absorb acid) is best for absorption into the skin, go with the latter if possible as this covers even the fussiest of skin carers. A good storage method ie. a dark glass dropper like as shown is preferable as it keeps light and contamination at bay at keeps it fresher for longer. As I said Vitamin C is very unstable. This mixture will last you for 1 week maximum, then it will become obsolete. New batches are easy to make, so make it weekly if possible. If you will remember to use it – Keep it in the fridge if at all possible, it helps the sustainability of the vitamins. Its important to get your tolerance up and start with a lower ratio of Vitamin C to water, as its an acid and some skins are more sensitive than others. 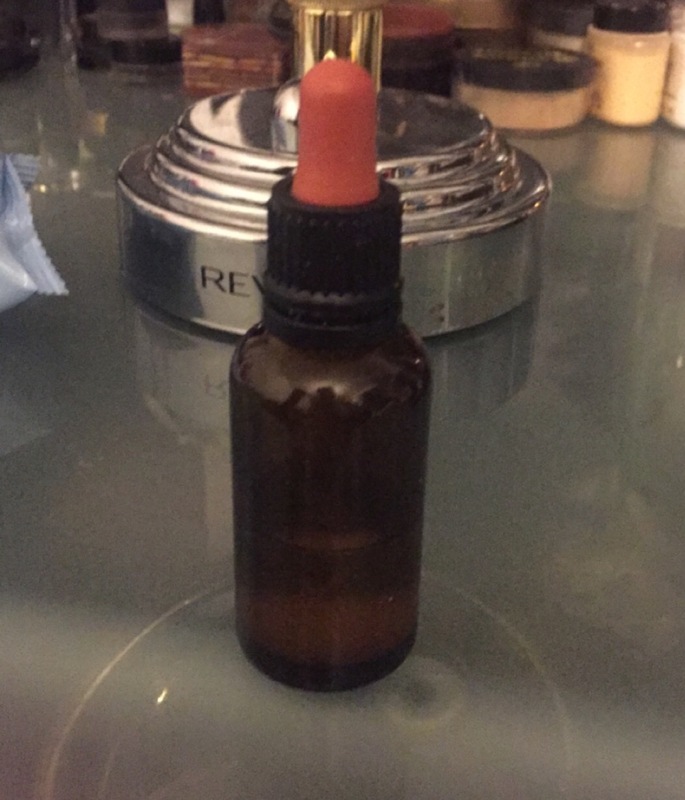 I tend to mix it directly in the bottle and shake to help the powder dissolve but you can mix in a sterile pot and top the contents into a suitable bottle. You can also add a few drops of glycerin into the mix if you want more of a serum texture. 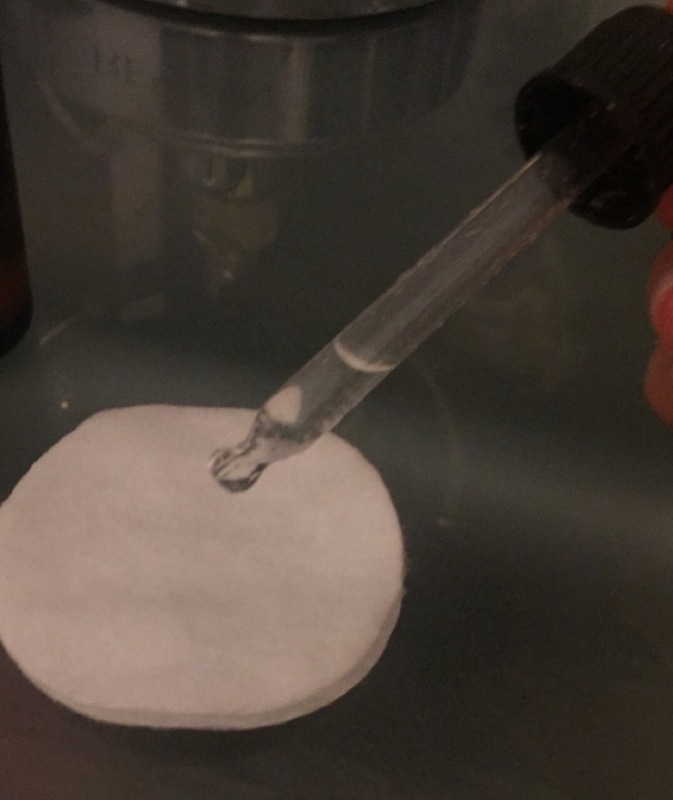 Here you can see how the powder sits in the water (and is a bit messy sound the top if you mix it directly into the bottle, but this can be cleared up later) – Bear in mind this is a strong potency as I’ve been using this for a while. So how do I use it? And what results have I seen?…. I use this in the morning after cleansing and in the evening after cleansing. This acts like a toner. I apply in to the skin on a cotton pad and leave to dry for a few minutes, I then continue with my normal serums and moisturisers. Ive seen a massive difference in tone, my skin looks much smoother and even toned, I had some areas of ever so slight discolouration and uneven texture and that has completely disappeared. My scar also definitely seems to be getting lighter in colour and decreasing in size and projection. Overall a wonder product I use this day in day out and make a new batch every week!